ePublishing Knowledge BaseePublishing Knowledge BaseePublishing Knowledge Base Creating and Managing EventsHow do I search for an event? 1. 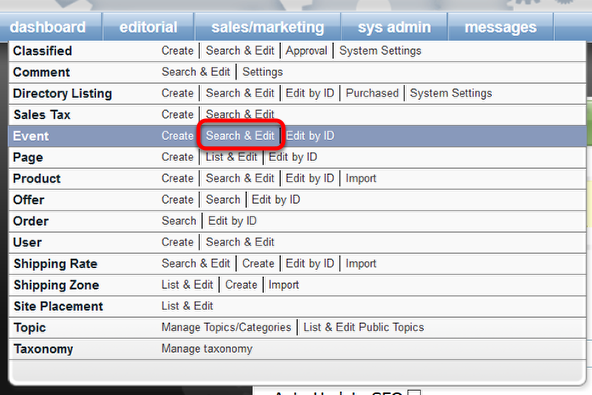 To search for an event, click Search & Edit next to Event under Sales/Marketing in your Admin dashboard. 2. Enter your Search terms in the top field, including keywords matching associated company names, event ID or title. If relevant, you may also select the State the event will be held in, as well as the beginning and ending dates for the event. If you enter a beginning date without an ending date, the assumption is the end date is today. To limit your results to only those events that are UNPUBLISHED, select the checkbox next to Show Inactive? To limit results to only those events that are PUBLISHED, select the checkbox next to Show Active? 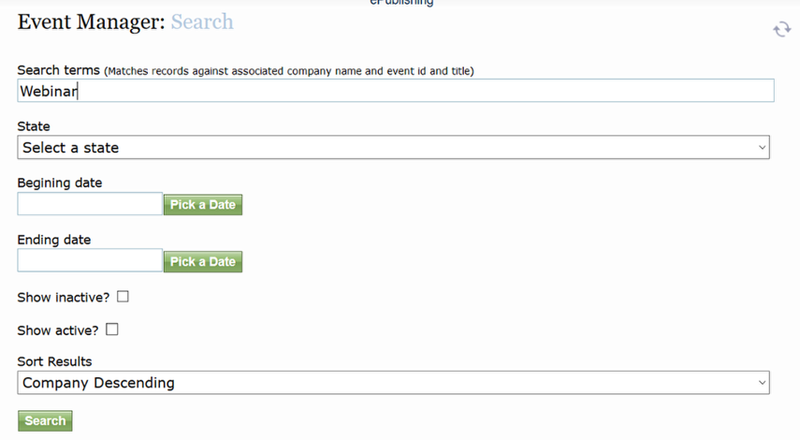 Zoom: Enter your Search terms in the top field, including keywords matching associated company names, event ID or title. 3. If you'd like your results in a particular order, select your preference under Sort Results. Zoom: If you'd like your results in a particular order, select your preference under Sort Results. Title: Title of the event. Clicking the event title opens the Event Manager for the chosen event. 5. Click the event title to open the event in the Event Manager for editing. Zoom: Click the event title to open the event in the Event Manager for editing. Prev: How do I preview my event landing page? Next: How do I delete an event?